RAISR, which was introduced in November, uses machine learning to produce great quality versions of low-resolution images, allowing you to see beautiful photos as the photographers intended them to be seen. 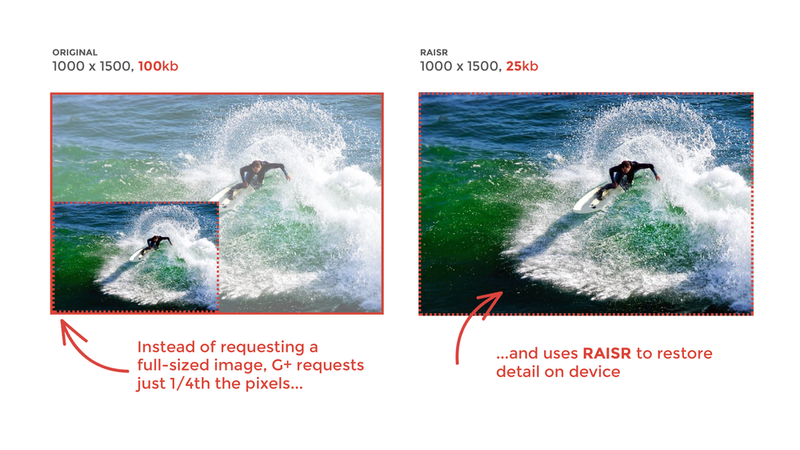 By using RAISR to display some of the large images on Google+, we’ve been able to use up to 75 percent less bandwidth per image we’ve applied it to. If you want to do a poor man implementation of this on your own check out Google HTTP client hints. These are new headers that Chrome includes when requesting resources to your server. This way if you have a custom image resize service you could implement some code to set a max size on the returned images based on the clients device capabilities.